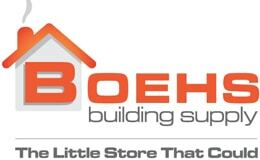 From plumbing to electrical, Boehs Building Supply have just what you need! When your job calls for Torx screws, we are the ones to help you find what you need. Our Torx inventory includes both Gold Star general purpose screws and Bronze Star ACQ compatible screws. With numerous sizes of screws in 1lb, 5lb, or 25lb packs, we have the largest assortment in northwestern Oklahoma! Gorilla Glue and Gorilla Tape are just two more of the many specialty products available in our store! Need an exceptional shine on your hardwood, stone, or tile floor? We carry the Bona Swedish Formula Floor Care Systems. Beam Central Vacuum Systems by Electrolux are in stock and ready to be installed in your home. Come on in for a demonstration! OXO International Good Grips kitchen accessories, Bunn Coffee Brewers, and White Mountain Ice-Cream freezers are a few more of the household items in stock at Boehs Building Supply. We are always expanding our Household Department so keep us in mind! For more information, contact us today!